Celebrate the cartography of your life with this tempered glass board showing the locale around your address. Whether it's your favorite vacation destination or the spot where you met, this custom map board celebrates the cartography of your life. The tempered glass board displays three square miles around your address of choice, including streets, parks, bodies of water, and a star to mark your special spot. 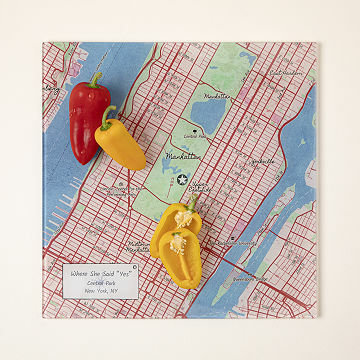 Use it as a prep board, trivet, or touch of kitchen decor to celebrate hometowns and favorite corners of the country. Complete with a personalized legend and rubber feet to protect tables, it makes a distinctive hostess or housewarming gift. Made in Providence, Rhode Island. These maps are reproduced from the kind you can now find in quaint vintage shops. That means they show the beauty of the topography and most streets and landmarks, but you might not see your favorite new coffee shop. Can be used as display, cutting board or cheese board. We ordered this as a gift for college friend on west coast. We live on east coast. So this was a great memory of where they met. He lived it! Thanks for a unique personal gift for our foodie friend. I haven't decided if I will use it or display it or both. I am very impressed with this map cutting board. I showed it to my neighbor & she also was impressed with it. This was a gift to my in-laws. They currently have it on display in their kitchen, but will use it as more of a serving platter during special occasions. It was for myself, but it would also make a great gift. I bought this as a gift for my boyfriend and haven't given it to him yet...so we haven't used it. But it looks great and seems like very quality construction. I'm sure we will both love using it. It's unique and looks like it's great quality. Haven't used it yet, as it's for a gift. My wife loves to host and especially loves to host when a group can share the story of their lives together. This classy serving tray (/cutting board) gets the conversation going. I was so pleased to find a gift that met my needs. It arrived quickly and appears to be a quality item.The recipient lives in a historic district and grew up in the area, so I think he was really touched by this gift. I would recommend this gift because it's unique and personal and the price point was good. They loved the gift and thought the design idea was clever.